To foster and promote the welfare and advancement of forestry education within Western North Carolina. 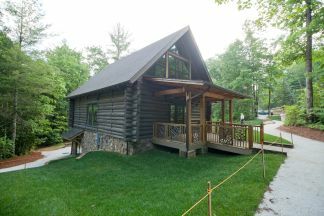 WNC Communities was selected by Commissioner Steve Troxler of the NC Department of Agriculture & Consumer Services to complete and “up fit” a handcrafted log building in the DuPont State Forest located at the High Falls Access Area on Staton Road in Transylvania County. Read more about the project here, DuPont State Forest’s Aleen Steinberg Center.